- Publisher ?Homosexuality is the hot issue of the day, ? says Edward T. Welch in this booklet. ?Even more than abortion, it will confront the church throughout this generation, forcing us to listen, study, and respond wisely.? How can we answer claims that the Bible does not prohibit committed homosexual relationships? Or that science proves that homosexuality is genetic, not a chosen lifestyle? Welch supplies us with timely biblical and biological insight into homosexuality. Just as importantly, he calls us to examine our attitudes in order to minister to homosexuals truthfully, compassionately, humbly, and persuasively. 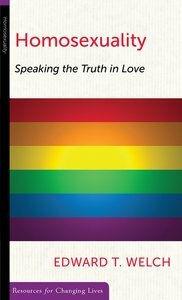 About "Homosexuality: Speaking the Truth in Love (Resources For Changing Lives Series)"
?Homosexuality is the hot issue of the day, ? says Edward T. Welch in this booklet. ?Even more than abortion, it will confront the church throughout this generation, forcing us to listen, study, and respond wisely.? How can we answer claims that the Bible does not prohibit committed homosexual relationships? Or that science proves that homosexuality is genetic, not a chosen lifestyle? Welch supplies us with timely biblical and biological insight into homosexuality. Just as importantly, he calls us to examine our attitudes in order to minister to homosexuals truthfully, compassionately, humbly, and persuasively.